It is always a great pleasure to visit the Republic of Fiji. The warm hospitality of you people and Government makes our delegation feel right at home. It is indeed an honour to address this House of Parliament. I know Papua New Guinea is only the second country to have been accorded this honour. This is after a friend of both Papua New Guinea and Fiji, the Prime Minister of India, Narendra Modi, addressed this House in 2014. As Melanesian brothers, and close bilateral partners, the friendship between Fiji and Papua New Guinea continues to grow stronger. Together we are moving into new dimensions of trade and social engagement – this is in the spirit of co-operation and mutual respect that was established by our forefathers. Trade and investment is continuing on an upward climb. There are more companies from both countries investing than ever before. In areas such as hotels, banking and agriculture – we want to keep strengthening Papua New Guinea’s engagement with Fiji. We want to increase our partnership arrangements and strengthen our collective position. The global political economy in which we live today is experiencing a lot of change – with increased tension and geo-political competition. We, as Melenesian and Pacific Island Nations, must work together and simply get on with doing what is best for our countries and the region. Much of our relationship is conducted bilaterally – but we also have strong bonds in the sub-regional and multilateral context. This is through forums such as the Melanesian Spearhead Group, and of course, the Pacific Islands Forum. Through these existing mechanisms – we have all benefitted. High level official exchanges between our countries will and must deepen even further. We are Melanesians, we are Pacific Islanders – and while we are small in population compared to the rest of the world, collectively we are strong. There are many issues on which we have no choice but to work together. 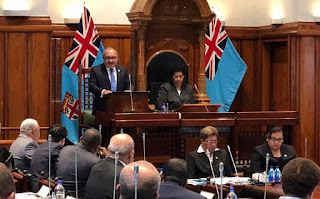 There is probably no greater challenge confronting Papua New Guinea and Fiji, and all Pacific Island Nations – than dangers posed by Climate Change. Papua New Guinea, and our region, greatly appreciates Fiji’s leadership on this issue. Fiji’s central role at COP-23 in Bonn, Germany, is an example of the right approach we must take. Pacific Islands did not cause this problem – the threats we face today are a reality. While we in the Pacific did not cause climate change – our villages and towns, from our cities to our remote communities – are suffering from climate change. Climate change is real – and it is hurting our people. Extreme weather leading to cyclones such as Cyclones Josie and Keni this year, after Cyclone Winston in 2016, have been of terrible ferocity and severity. Extreme drought also crippled parts of Papua New Guinea in recent years. And we are seeing changes in our biodiversity – invasive species of pests and disease are on the move and decimating crops. Changes in ocean temperatures and water movements are destroying our fish stocks. Sadly, Papua New Guinea is the home to the world’s first climate change refugees. The people of the Carteret Islands, in Bougainville, have seen their houses and their gardens washed away by tidal surges. They are now leaving behind the islands their people called home for thousands of years. This is not fair – it is simply not fair. Just as it is not fair that villagers in Fiji and every other island Nation in the Pacific are being forced from their homes. We have to act together – because if we do not stand up for ourselves – we cannot expect other countries to stand up for us. As a group of Pacific countries, together with developing nations around the world – from Africa to the Caribbean, must work together. We have to maintain pressure on industrialised countries to reduce their emissions. We have to start to reverse climate change for the safety and health of our future generations. We are in this together – and as Pacific Brothers and Sisters, we will stand side-by-side and take on the rest of the world will take notice. Papua New Guinea fully supports Fiji’s leadership through the Talanoa dialogue – that is being facilitated through the Climate Action Pacific Partnership. We must work together on other multilateral issues – particularly through the United Nations. Papua New Guinea is fully supportive of Fiji’s bid for representation at the United Nations High Commissioner for Refugees. On that note, I would like to congratulate Fiji on its 40th Anniversary of International Peacekeeping Missions. Fijian military personnel have saved many lives over the past forty years, and your efforts must be commended. Labour mobility is another area of shared interest for our two countries. We want to see more of our professionals gaining experience and applying their skills around the region. Particularly when it comes to areas such as healthcare, education and the public service – there is much to be gained by increasing measures for our people to travel and work. There are a number of similarities between the approach taken by our two countries to advance development for our people. Importantly, our Governments have a very clear focus on building and strengthening infrastructure as a path to development. In Papua New Guinea we are building more roads, airports, sea ports, colleges and university campuses, and healthcare centres than ever before. We have to keep providing the infrastructure that is needed for business to grow and prosper. I am very impressed with the infrastructure development that I have seen in Fiji in recent years. There is a lot for us to discuss, and to share experiences, so that we can advance the lives of our people. Ultimately, expanding trade and investment is central to economic development. Trade and investment between our courtiers is growing – but it could be better. I would like our two countries to explore options for a free trade agreement between our two countries. Lets look at our individual and collective strengths. Let’s look at how we can use our comparative advantages to lower prices for our people, and value-add for our industries. I propose that our two countries look seriously at and consider the feasibility of a free trade agreement. I will leave this to our officials to discuss and advance, and to provide their opinions to elected leaders. Finally, as you know, Papua New Guinea is the host of APEC in 2018. APEC is a forum of 21 Member Economies – including China, the United States, Japan, Australia and Russia. APEC accounts for more than half of global trade, and more than half of global GDP. It is a enormous trade and investment area – and we need to make much better linkages between APEC and Pacific Island Nations. As the only Pacific Island Nation in APEC – it is time that we host an APEC year, leading to the Leaders’ Summit in November. We are ensuring that APEC in Papua New Guinea is a truly Pacific APEC. We will still have the highest level of APEC security, but our visiting Leaders, Ministers and delegates will truly know that they are in the Pacific. APEC will be more relaxed than in previous years and have an agenda of real relevance to developing economies. As a forum – APEC offers a great deal to its members, particularly developing economies through a number of capacity building programs and initiatives. The range of substantive areas in which APEC is engaged is broad. This includes sectors such as forestry, agriculture, fisheries, transportation, SME businesses, as well as anti-corruption, emergency preparedness and counter-terrorism. In each of these, and many other sectors, APEC helps to enhance economic activity. For developing economies, this includes technical projects and other working level forums to help build our capacity. APEC shares information between member economies, so that we can all gain from the past experience of others. This is all about improving connectivity for our people, promoting sustainable and inclusive growth, and enhancing structural reforms. This theme and priorities are the building-blocks of growth and development. The theme is built upon APEC’s important legacy work on growth, connectivity and the onset of the digital economy in recent decades. Digital technologies have the potential to act as a future catalyst of growth. Importantly, APEC 2018 in Papua New Guinea is about ensuring that no one is left behind. As our region experiences growth, we ensure that growth is inclusive. We have to create opportunities for small businesses to expand, we must make sure that education is available for all of our young people. At its core, APEC remains a forum for liberalising trade and investment across the region. It has experienced substantial success in removing barriers to trade and investment, and APEC has stimulated job growth. We are now more than half-way into Papua New Guinea’s hosting of APEC in 2018. This is also a particularly challenging year for global trade – with rising isolationism in some economies. So far, APEC in Papua New Guinea has delivered a consensus statement on regional trade at the ministerial level. This is currently the only statement on global trade from an international forum in 2018. This is after the inability of EU Ministers and the G7 to produce consensus statements on trade this year. Commencing the 4th of August, the third round of senior officials’ meetings for 2018 will begin in Port Moresby. This will be followed by ministerial level meetings in sectors such as Finance, Mining and Women in the Economy. The conclusion of the APEC year is the Leaders’ Summit in November – attended by the Prime Ministers and Presidents of APEC economies. The APEC Leaders Week will also include a meeting of foreign Affairs and Trade Ministers, and the APEC CEO Summit. In total, around 9,000 government officials and business leaders will be in Port Moresby during the APEC Leaders’ Week. In keeping with our commitment to deliver a truly Pacific APEC – I am inviting the Leaders of all Pacific Islands Forum members to attend APEC. Obviously, Australia, New Zealand and Papua New Guinea are already attending – and I want the other PIF Leaders to be there with us. It is important that we highlight the Pacific in Asia-Pacific. We must show our APEC members – from Russia in the west to Mexico in the East – that the Pacific has a lot to offer. Prime Minister Bainimarama, I extend my invitation to you to attend APEC Leaders’ Week. I also invite you to attend a Pacific Island Leaders’ meeting with the President of China, His Excellency Xi Jinping, during his State visit to Papua New Guinea in the days before the APEC Leaders’ Meeting. Prime Minister, Ministers, Members of Parliament. Thank you for your historic invitation to address your Parliament. Papua New Guinea has a true friend in Fiji, and we will work together to advance the interests of our people. We will deliver growth and development and improve standards of living. This can only be done through partnership and goodwill. Thank you, and may God continue to bless Fiji and Papua New Guinea.